From the makers of the world's leading luxury sports car comes the all-new 2019 Porsche Macan. 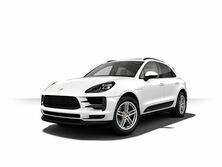 This one-of-a-kind luxury compact SUV combines the racing performance and plush interiors you've come to expect from Porsche with the price point that suits its more family-friendly experience. Below is our review of the updates and new upgrades available on this latest year model year Macan. 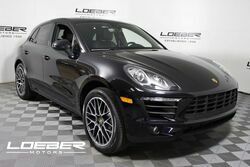 After you've done your research, we invite you to test drive the all-new 2019 Porsche Macan at Loeber Motors Porsche near Glenview, IL! The 2019 Porsche Macan is designed for a true performance experience. That's why this latest model year offers an all-new 3.0L turbocharged V6 engine. 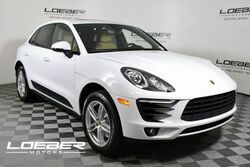 With its standard seven-speed, 238-hp turbocharged engine and 141 mph top track speed, this compact SUV boasts a true Porsche feel, complete with its zippy acceleration, sharp handling, and responsive suspension. Upgrade to the Macan S to get 348 horsepower and a 0-60 of 4.9 seconds. The Macan S now boasts the same engine as the proven Cayenne and Panamera models. Looking for even more thrill? The 2019 Porsche Macan GTSputs out 360 horsepower with its V6 twin-turbocharged engine for an athletic 159 mph top speed. The powerful engine is paired with lowered suspension, sharpened handling, and improved traction technology, just as you would expect from a true sports car. The Porsche Active Suspension Management controls each wheel individually to provide a responsive and ultra-comfortable ride. Add on the Sport Chrono package for the next level of performance. The Sports Chrono package emphasizes an improved chassis, engine transmission, and suspension for the ultimate race car experience. Simply press the Sports Response button to make your Porsche Macan more responsive and track your driving stats through the touchscreen console. 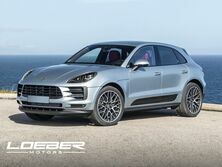 The 2019 Porsche Macan features a reconfigured exterior designed to better showcase the power of the engine under its hood. The rear of the vehicle is trimmed with an all-new taillight design that spotlights the Porsche logo. The rear wheelhouses have been refined to more closely reflect its ultra-sporty cousin, the Porsche 911. But Porsche doesn't put style over function. This redesign enhances aerodynamic properties for improved fuel efficiency and re-configures the rear brake lights for a more functional and aesthetically pleasing arrangement. The headlamps have been upgraded to an LED strip that runs the width of the vehicle, a beloved style borrowed from the Porsche Panamera. This year adds four additional exterior color options as well: Miami Blue, Mamba Green, Dolomite Silver, and Crayon. Style connoisseurs can also upgrade to 20” or 21” wheels for an extra sporty look. 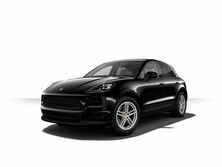 Luxury performance on the outside partnered with luxury comfort on the inside—the 2019 Porsche Macan continues the legacy of all-around class. Optional high-quality leather seating can be paired with a heated, leather-wrapped steering wheel for an ultimate plush interior. Choose from the highest quality trims, such as dark walnut wood or contrasting leather. Drivers of the Porsche Macan will appreciate the level of attention behind the “cockpit” design of its cluster panels and controls. Everything is perfectly within reach and intuitive to use. New for 2019 is the optional air ionizer to improve cargo air quality. Even in technology, the 2019 Porsche Macan is seeing big changes. The previous 7-inch entertainment system is now a standard 11-inch touchscreen, an upgrade that was so important to Porsche they re-engineered the placement of the air vents. This large, HD resolution display serves as the hub of the Porsche Communication Management (or PCM) system, which has also been greatly improved. The ability to customize your start menu makes managing your Macan's interior and performance controls easier and more efficient. Other upgrades this year include the voice control software, which has been reprogrammed to provide higher accuracy. The 2019 Porsche Macan still comes standard with online navigation with real-time traffic updates. The PCM system continues to provide connectivity with smartphones thanks to the handy Porsche Connect app, allowing you to update your travel destinations, stream music, and more, all right from your phone. Knowing the Macan is often purchased by families, Porsche put in top-of-the-line safety features. This compact SUV comes standard with lane departure warning and front and rear parking sensors. 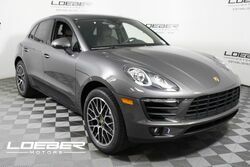 Why Buy from Loeber Porsche near Glenview, IL? With over 80 years of friendly, family-owned service, Loeber Motors Porsche has established itself as the go-to destination for luxury car buying. Our Porsche dealership near Glenview, IL employs a sales team passionate about all things Porsche as well as an expert finance team ready to make your luxury vehicles dreams a reality. We look forward to meeting you in our state-of-the-art showroom where you can explore the features of the 2019 Porsche Macan and take it for a test drive. It is our pleasure to help you go home in your new Porsche as a highly satisfied customer who will want to return to Loeber Porsche for all your future vehicle needs.